Here we are at the end of second stage.Here from the media team we are sorry for the delay of results, but you should know that in this stage area all the communications are completely shut down, no signal get here, not even cellphones… and sometimes it’s hard also for the satellite phones. So we hope you can forgive us, today it will be all posted on time. This morning Paolo Barghini wisely decided to give the start signal at 6:30 in the morning instead of 8:00. This, together with the cloudy sky, gave relief to the runners who had at least 2 hours of cool weather (well, relatively cool! ), and they got the chance to run easier. From 05:00 though, there was a strong wind that luckily stopped right before the start. The 250k runners were asked if they wanted to switch to the 150k due to the many difficulties encountered the previous day, but almost all of them said they would prefer to go on with the 250k. The runner walk off the path from camp 2 and disappeared through the Dolphin Valley, enormous and beautiful rock formations that, seen from the front, look like a group of dolphins swimming together. As time went by, the heat become stronger and stronger, so Paolo sent some cars between cp2 and cp3 till the final camp, distributing some extra water to the runners. The final camp was set close to the salt river, so the runners had the chance to enjoy the beautiful spot before finishing the stage. First came Rafael Fuchsgruber, leader of the Lite version, who made a good 03:46. Then, after almost 1 hour, it was Giuseppe Derosa turn to cross the finish line. Giuseppe suffered a bit from a previous injury at the knee, so – he said – “I had to walk for most of the final part”. It was 11:16 when Mohamad Ahansal got to the camp, first runner for the 250k version. He was welcomed by everyone and rest at the finish line table so he could see Alberto Tagliabue arrival, just 15 minutes later. The chef from Saronno – near Milano – is doing a great job, and this result confirmed his strength. Tullio Frau and Raffaele Brattoli, who switched to the Lite version, arrived 20 minutes later. All the finishers had a chat, and the atmosphere was really relaxed. Some of them went to their tents, but the heat started to hit hard and the tents were literally ovens. At 11:57 Pier Roberto Zanda made his appearence, he was pretty satisfied with his performance thought the heat started being a problem for him and all of them. 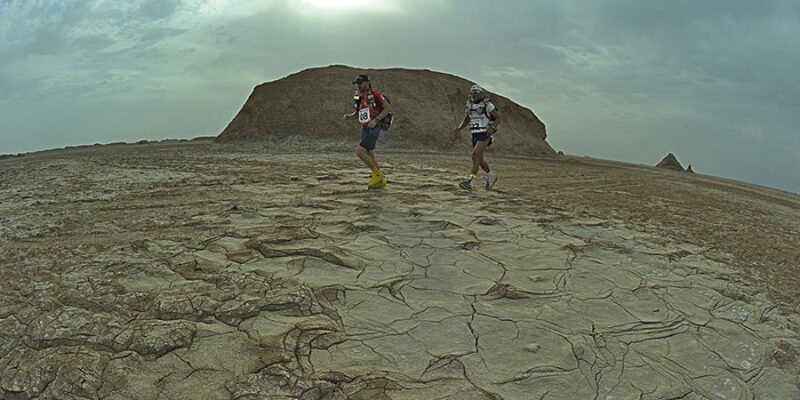 Nicola Ciani and Vahid Reyhani came at 12:16 and 12:18. Nicola was a bit more tired than the day before but with his time he made to keep the third place in the rank. Then it was time for Fabio Ferrario with his bike, who said that the course is amazing but there are some issues with bikers, like the soft sand in the first part and the hard bumps later. He enjoyed his stage though. Imad Ladkani (06:17) was a lot happier than the day before when he crosse the finish line. He felt better thanks to the cool weather at the beginning of the stage, who let him run for a long time before the sun started to hit hard. Giovanna Caria had some heath issues before getting to the camp, covered with a sleeping bag, trying to keep the heat away. She managed to finish the stage though, so thumbs up for the sardinian lady! Later, she went to the medical tent and the doctor let her body cooling down by asking the nurses to put wet paper on the stomach and abdomen. Also the norwegian Frode Lein, who got to the basecamp together with Christoph Harreither (Austria), and Moustapha Ahmad (Lebanon) was more satisfied than the previous stage, but he still suffered from pack pain, so he went almost immediately to rest in his tent. In the evening he was given cortisone to ease the muscular contraction that made him suffer during the day. Moustapha said that the second stage was a lot easier for him than the first, and he felt more relaxed. He complimented Paolo and the organization. Then it was time for the girls Laura ricci (Italy) and Jenny davis (GB) ran together for most of the stage, teaching each other some words in their own language. Laura said “It was good to run with Jenny, i saw her so close and thought that iw would be easier to run together instead of trying to surpass each other. And it was fun!” Gian Carlo Enna arrived with the girls, and he was pretty satisfied of the track and of the chance of getting some axtra water to cool down in the central part of the stage. All was nice and smooth, the medical tent didn’t have as many guests as the day before… but we could see some black clouds at the horizon… and is no time a storm, with strong winds and heavy rain hit the area. The staff was busy trying to prevent the tents to fly away! In about 20 minutes the weather situation stabilized, but the air was a lot fresher and nicer. At 16:20 Stephanie Case with the iranian Free to Run ambassadors team (Masoumeh Torabi and Alireza Saadat) crossed the finish line: Mahsa was really happy of her result, expecially after all the problems she had yesterday. Farhad Shirzad closed the group: he finished at 5 pm. In the evening the camp was a really “happy place”: the runners were talking to each other, making jokes and telling each other their own stories. They shared a truly friendly and relaxed time. In the evening the medical tent had some visitors, especially visitors with blisters… the iranian doc was really busy treating the worst ones, and the record goes no doubt to Vahid! The poor guy’s feet were in a really a bad situations, and couple of times he yelled from pain while the doc was performing his “cutting&treating” routine. Frode Lein and Gian Carlo Enna too had their Blister Party, that amazed some staff member: “We do not have tv but we are entertaing people” said Frode, who is getting famous for his wicked sense of humor. The sun went down and gifted all of us with a special sunset. All was golden, and the light shed a wellbeing state on the camp. Step by step the stars came out and filled the night sky. Many of the runners enjoyed the moment from theur opened tents, and slowly all the camp noise fade. To put is in Scarlett O’Hara words: tomorrow is another stage.